We carry on with the new features of gvSIG 2.3 related to Dynamic Segmentation. In this post we will see the “Create routes” tool. This tool is useful to create routes from a linear layer. It works grouping the geometries of the input layer in one unique entity (linear), using a common attribute. This layer must have an attribute capable of identifying the routes to be created. 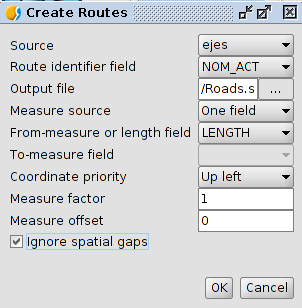 “Route identifier field”, the attribute from the table of the layer “Source” containing the route ID. “Output file”, the file to save all the results. One field, the original layer must have a field which indicates the length of each sections to reroute and the measure will be based on that field. Two fields,the original layer must have two fields indicating the M coordinate of the first and last vertex of each section and the measures will be based on those M using interpolations. “To-measure field”, the M coordinate will be used as the last vertex of the section. It will be enabled when the option “two fields” was selected in “Measure source”. “Measure factor”, the user can set a factor to multiply the measures before introducing them in the M coordinate of the vertex. By default the value is 1. “Measure offset”, the user can introduce one value to be added to the measures before introducing them in the M coordinate of the vertex. By default the value is 0,0. “Ignore spatial holes”, to decide if the size between the holes of the geometries has to be taken into account for the calculation of the measures. It will be enabled only when “Length” or “One Field” was selected in “Origin of measures”. If this is selected, the distance between the last vertex of one section and the first one of the next will not be taken into account. If it is not selected, the distance between them will have an effect on the calculation of the M coordinate of the first vertex (and further ones) of the next section. When accepting the dialog box, gvSIG will create the “output layer” file containing the lines of the original layer grouped by the new entities according to the “Route ID” value and the rest of options already introduced by the user. If, before the tool execution, the origin layer has a selection, the process only will take place in those selected elements. This entry was posted in english, gvSIG Desktop, gvSIG Roads and tagged carreteras, Segmentación dinámica, Sistema de referencia lineal. Bookmark the permalink.